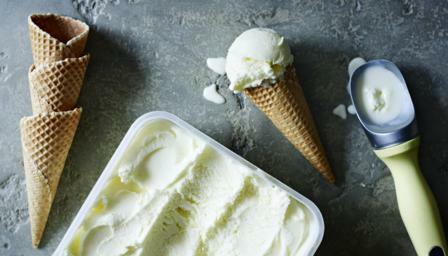 This is a light and refreshing lemon ice cream that you can make without an ice cream maker. Try freezing in ramekins or glasses and top with raspberries and a dusting of icing sugar. Whisk the cream in a bowl until soft peaks form when the whisk is removed. Stir in the yoghurt, lemon zest and juice, sugar and milk. Whisk until well combined. Pour into a 1.5 litre/2½ pint shallow plastic container, cover with a lid and freeze for at least six hours, preferably overnight, until firm. Remove the ice cream from the freezer, cut into chunks and blend in a processor until smooth and creamy. Return to the plastic container, cover with the lid and return to the freezer until required.